FUJIFILM North America Corporation, Graphic Systems Division is pleased to announce from the show floor at Labelexpo the purchase of Graphium, a digital hybrid, four color plus white UV inkjet press integrated with inline flexo and finishing, by Distinct Packabilities, a Shepherdsville, Kentucky-based print provider. Graphium is a high speed hybrid UV inkjet press designed specifically for the narrow web market by FFEI, Ltd. and marketed exclusively in North America by Fujifilm. It’s the first press to be configured with under and over white, allowing pure white designs with opacity that exceeds traditional flexo white. Its modular design provides the ultimate functionality as it combines inkjet, flexographic printing and finishing, all inline. Utilizing greyscale print heads that produce a range of drop sizes from 6 to 42 picoliters combined with inter-color LED pinning of Fujifilm Uvijet inks enables Graphium to print fine details, smooth tones and small font text demanded by the most exacting customers at single-pass print speeds up to 164 ft./min. Flexo stations with Fujifilm Clarity Water Washable Flexo plates and Fujifilm UV Flexo inks are configured inline before and after the inkjet print engine to provide the ultimate capability to produce unique, high quality labels. Distinct Packabilities provides a variety of service offerings to flexible packaging and prime label end users, and are particularly well known for producing outstanding quality on their state-of-the-art flexo presses utilizing Fujifilm Clarity Water Washable Flexo plates and Fujifilm Flexo inks. Expanding their services into digital printing was the next logical step; and greatly enhances their project portfolio. Distinct Packabilities chose Graphium based on the capabilities of its hybrid design, incorporating digital and flexo printing into one platform, to create spot colors, respond quickly to short run demands, and produce flexible packaging and prime labels, without the common limitations often found throughout the industry. These newly added capabilities will allow the company to support brand owner’s needs for colors and graphics that stand out on store shelves. Haley says Graphium offers labels and packaging printers a digital print quality and capability proposition which had previously not been available. He is anxious to get the press into the production environment in order to begin offering a new suite of products and services to current and prospective customers. “Its print capability can produce up to 13,240 feet per hour at a resolution up to 1080 dpi and an eight-level grayscale. This digital press will print all of the common substrates found throughout our other production processes while achieving excellent adhesion, light fastness, and durability. Also, for us, the ability to very quickly move in and out of a rapidly changing print schedule is very important,” added Haley. Graphium is able to handle a print width of either 13 inches or 16 inches, and can print some of the thinnest label substrates up to heavy duty vinyl, as well as board stock. Graphium offers printers an alternative to flexo printing on short to medium-run, four-color plus white labels and packaging, allowing for up to six flexo stations and inline finishing options. Graphium provides a level of flexibility and productivity to print the complex projects that customers increasingly require in today’s market. The inline corona treatment enables customers to print on virtually any substrate without the requirement of a pre coating to achieve adhesion. At Fujifilm booth # 5621 attendees experienced in-person the Graphium digital press with inline flexo print a variety of ‘fit to purpose’ label applications. Each day at the show, Fujifilm is demonstrating hourly how this hybrid system can print digital CMYK, under white, over white, flexo spot colors and a matte clear varnish finish. The daily demonstrations also feature high quality Clarity Water Washable Flexo plates, along with the bright, vibrant color of Fujifilm UV Flexo and Waterbase Flexo inks. See FujifilmWhatsChanging.com for Graphium demonstration times and additional details. Follow Fujifilm Graphic Systems Division on Twitter @FUJIFILMGS, and see tweets from the Labelexpo show floor, #WhatsChanging. Follow Distinct Packabilities on Twitter @DistinctPack and watch for their tweets, #FavPak. 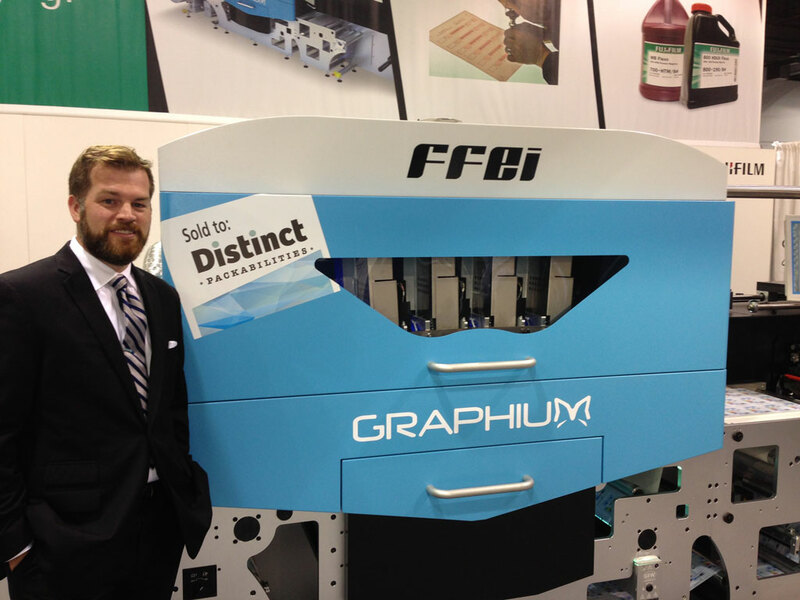 Pictured above, David Haley, VP, Distinct Packabilities, proudly stands next to his newly purchased Graphium, on the show floor at Labelexpo.